Six Questions from Six Experts – helping you get unstuck! Sometimes a simple question brings the answer you need most. Just ask & listen! Daily life is often overwhelming. There is so much information coming at us all the time. There are decisions to be made and actions to take. Sometimes taking a 10 minute break to breathe, center, ground and tune in is the best thing to do. We have chosen six potent questions from six wise guides that you can use anytime. They are especially helpful when you are feeling stuck or unsure. These questions apply SEE IT. MAP IT. DO IT. © to whatever is going on right now. You can also use them for big things like getting clear for your whole year!! Note: we are also sharing who was the source of each question to express gratitude and make it easy for you to get more from them. By acknowledging the role that needs your attention, you can release the others and be present. Jinny also teaches that choosing one ROLE to focus on for the whole year is life changing. We agree. Shelly is a powerful messenger for clearing up the MESS in your head. This stunning question cuts to the very core and gets rid of all the distractions. Ask this NOW – what would your message be? Terry believes that following your passion is the key; both in the moment and in your life. This question help you tap into your true life force. Mary is a healer and master of aligning the body with intuition. Mary teaches that your body always tells the truth. The body is wise and has so much to share. Your body is just waiting for you to listen. The invitation to you – choose one (or more) of these questions. 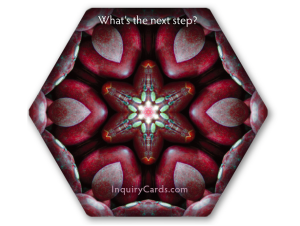 Take a time out to center, ask, listen and then write what comes? Please share with us anytime. We would love to witness you in the moment. We hope you find clarity in the moment. We want you to know that your life matters in this world! Let Your Bedroom be a Sanctuary! Let’s take a look at your Bedroom! Is it time for a change? Is your bedroom a sanctuary or a dumping ground? As professional organizers we are often asked, “where should I start organizing in my home? There is clutter and chaos everywhere.” Your bedroom is the place to start! The bedroom often becomes the landing zone for homeless items, or the make shift home office, the TV room, or even a place where a person can’t sleep anymore because there is so much clutter. This breaks my heart. Your bedroom is meant to be a place of rest, relaxation, intimacy and healing. You spend more time here than anywhere else. It can be a favorite room in the early morning and late evening. One of the best gifts you can give yourself, especially in the cold months of winter, is creating a bedroom that is a sanctuary. So here is a true story from Marla’s past – I asked my talented friend, Jeanine Mallory of Fresh Space Organizing, to help with a client’s bedroom. The woman had moved in months before, but her bedroom was boring and plain. She is a talented artist, loves color, fabric and unusual things. So we needed a makeover. By following the steps below and working together we transformed her bedroom in a day. We went shopping at Ikea! We hung purple curtains on the wall behind her bed along with sparkly lights. We brought in bright colors and candles. We used things she already had and found perfect homes for them. She now loves being in her bedroom. She is reading, journaling and sleeping so much better. How about you? Is it time for a makeover of your bedroom? Be brave. We invite you to take a look in your bedroom today and pretend you are a stranger. Just notice what is there and how it feels. Are there items that don’t belong in your room and that drain you when you look at them? What patterns do you notice? What do you notice that you love? Take it all in. How do you want your bedroom to look, feel and function? Do you want color or neutral shades or a combination? Do you want busy or simple? Do you want to add something like a reading or meditation chair? What you do want to take out or change? Take 5-10 minutes and write down what you want. Then set the timer for one more hour and ask what you can add or move or change so that the room feels fabulous to you! Please let us know what you do! Six SIMPLE Practices for the New Year! A practice is an ongoing activity that adds meaning or deepening to life. Choose one new practice just for you. In these fast-paced times, it is easy to forget that I am in charge of my life. I am the one choosing who and what gets my attention. It is not my family, my boss, my country or the world that determines my path. It is up to me. The beginning of the year is a wondrous time to reconnect with my center and create practices that will support me living true to myself. The simpler the practice, the better. Here are six simple practices to support you reclaiming your space, your day and your precious life. 1. Simplify your choices. This year choose just one small, one medium and one large project for each season. For example, your purse (or wallet), the kitchen counter and the bedroom. Rather than carrying the stress of all the clutter—of “too much to do”—all the time. The lists can keep you awake at night and rob you of health and peace of mind. By consciously choosing which projects you will take on, you allow yourself to release all the others. They can wait. Also, each season has its own energy. You can tap into winter and ask what projects would feel good to do now. 2. Honor your bedroom. The bedroom is the most important room in your home. You spend more time there than anywhere else. The purpose of the bedroom is healing, rest and intimacy. Yet, this room often becomes the dumping ground for clutter or distractions. Take time to ask yourself: How do I want my bedroom to look and feel? What colors, textures and furniture do I want? It’s wonderful to wake up surrounded by beauty and end the day nurtured by your sweet space. Then practice keeping this space feeling sweet & sacred. 3. Choose the top three each day. The simplest and most powerful way to reclaim your day is to take 5-10 minutes in the morning and ask: What are the three most important things for me to do today? These are the three things that only you can do and that you know in your heart and gut are most important. Write them down on a 3×5 card, your smart phone or a post-it note. A shift happens in the physical plane when you write things down. Then do the three things first. Give them your commitment and attention. Ask the Universe to support you. 4. Open and close your day. Commit this year to consciously taking 30 minutes in the morning and evening to open and close your day. Rather than diving into action the moment you open your eyes or collapsing into bed when you are exhausted, take time to transition your body, heart, brain and spirit. Follow the natural cycle of Earth. The sun slowly rises and then sets. You can create your own rituals. A morning cup of tea and sitting quietly while your body and brain wake up is a heavenly way to begin your day. Soft jammies, a comfy chair and a good book make for a divine ending no matter what age you are. What do you want? Make a list of your possible rituals and try them out. 5. Get a buddy. Change and growth are not meant to be done alone. Also it is just more fun with a buddy. Commit to getting together at least once a month for a year to help each other. Choose the project that would mean the most to you and be amazed at how much more you get done as a team. 6. Choose a theme. Stay connected with your self throughout the year with a single word that holds your intention. (Examples: trust, hope, play, action.) Then enjoy noticing how the Universe makes this real for you. We would love to have you share your word with us. Our invitation is to choose one practice and let it deepen your life this year. Make 2016 the year you get to know yourself better (or again). Marla Dee’s Top Ten Organizing TIPS! Reclaim your space, your day and your life! Do you have clutter and chaos in your life? Download our TOP TEN Tips for the Year. Marla will be taking a deeper look at them at the home show and will be speaking each day, so mark your calendars and come! If you can’t join us stay tuned throughout the month as we share the tips with you. We want to support you in reclaiming your space, your day and your life. Extra TIP& GIFT: Have a one-page master map for your year that inspires, empowers and supports you. Here is the form that we use with our clients. It’s our gift to you! If you would like a personal session with Marla to expand on this, click here. Marla Dee is speaking again at the Salt Lake Home Show. Friday January 8th @ 4 p.m.
Saturday January 9th @ 11 a.m.
Sunday January 10th @ 12 p.m.
Visit our table next to the Design Stage to enter our drawing and receive special offers! You can save $2 per person by purchasing tickets online. Show Information: Friday, Jan. 8th @ 2:00 p.m. through Sunday, Jan. 10th @ 6:00 p.m.
Go here for additional information and directions.